United Nations, Sep 18 (IANS) UN Secretary-General Antonio Guterres and US President Donald Trump on Monday called for a change of bureaucracy in the United Nations. Guterres and Trump made their statement at a high-level UN reform meeting in New York, Xinhua reported. 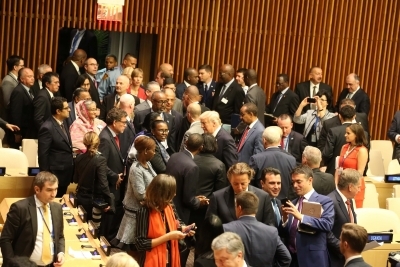 Guterres said efforts were needed to change “fragmented structures” and “byzantine procedures” in the UN, making it a more “nimble and effective, flexible and efficient” global organisation. He also mentioned that the UN is making progress on a broad and bold reform agenda to strengthen itself. Addressing the meeting, Trump said the UN has been kept from reaching its full potential because of bureaucracy and mismanagement. He praised Guterres for laying out a vision to reform the world body, noting that there have been changes under the secretary-general.